SuperRepo is a super Kodi repository. And for that, we have prepared a super guide. People who want to use different Kodi add-ons have a lot of options in their hands. One way to get all your favorite Kodi add-ons is to simply go to the official website of the Kodi add-on and then download those Kodi add-on plugins on your own in a direct method. The other way is to use some developer’s Kodi repository. Kodi users who want to get the most bang for their buck and want to save time and install several Kodi add-ons with a minimum of hassle then they will probably want to go with the option of installing a larger Kodi repository. One of those big Kodi repositories is SuperRepo. This is probably the biggest Kodi repository in the Kodi community today. If you install Kodi repository SuperRepo right now, you will probably get more than one thousands legitimate Kodi add-ons. 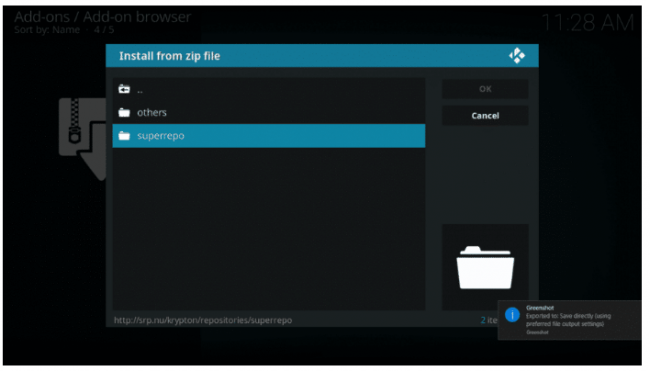 All bundled together in a neat and simple package in the form of SuperRepo. SuperRepo serves Kodi users by saving them a lot of time. With SuperRepo, Kodi users don’t have to go out in the open and search for their favorite add-ons. No longer do you have to spend hours on which add-on is the best for your favorite content. Then you don’t have to spend an infinite amount of time satisfying all the dependencies that come with some of the best Kodi add-ons in the market today. With a big repository like SuperRepo, you can forget about all those problems. SuperRepo has gone up a level in its importance in the last couple of months. Because other big repositories such as Indigo and TVAddons have disappeared from the scene. Both of these tools are now gone. So Kodi users who made use of these repositories will now have very few options if they want to access those quick installation methods in order to save time. For Kodi users who find it too hard to search for their favorite Kodi add-ons, there isn’t a better option than SuperRepo at the moment. Of course, that might change if tools such as Indigo installer and TVAddons decide to come back somehow. With all of that said, it is true that SuperRepo is probably your best option when it comes to installing a large amount of Kodi add-ons in a quick manner. Those who are too used to Indigo and/or TVAddons should at least consider this repository as their primary backup Kodi repository. Users who are new to Kodi and don’t really know how things work can also install SuperRepo Kodi repository in order to get started on watching their favorite content as quickly as possible. Simply put, installing SuperRepo Kodi repository is probably the best decision you can take right now. SuperRepo is also great for users who want to create more than an awesome Kodi setup on their devices in order to stream all types of content from a single streaming device. In the next couple of sections, we’ll provide users with a simplified but detailed Kodi guide on how to get started on installing SuperRepo on Kodi. Apart from doing that we will also cover some of the other important basics which are associated with users who want to install SuperRepo. We’ll explain what do we mean when we say Kodi repository. And we will also talk about how to use different repositories on your Kodi device. In this guide, we’ll also show users on how to recognize if their Kodi setup has updated their add-ons. Moreover, after guiding the user on how to install SuperREpo on their Kodi setup we will also show the readers on how to install the best Kodi add-ons from within SuperRepo. And of course, for those who want a Kodi experience that goes beyond SuperRepo, we will also list out alternatives. There is always the chance that the repository we have mentioned may not contain the Kodi add-on that you are looking for. So for such kind of users, it is important that we list out worthy alternatives. Before we get to the actual step-by-step guide first we have to deal with a disclaimer. Security gladiators only provides this guide as a form of help for users who want to access online content that they already have the permission to view and access. Most users get this right by buying their content. Sometimes users can’t access their content due to a variety of reasons either temporarily or permanently. Security Gladiators in no way supports or condones piracy. And hence we do not bear any responsibility for what the reader might and might not do with the information that we have provided in this guide. Furthermore, readers should know that Security Gladiators does not host, develop nor produce any of the software applications that we have mentioned in this guide. Security Gladiators also does not support people using, distributing and/or purchasing fully-loaded Kodi devices. And all such types of streaming devices which allow users to stream pirated content. Before guiding users on any technology related problem we always suggest that they take care of their privacy first. And the best way to ensure your privacy is to use a VPN service. VPN services are a must if you don’t want your internet service providers messing with your daily routine. This becomes especially important if you are using Kodi. A VPN with Kodi is a must for all users who care about their privacy. Why do we recommend using a VPN service? Because recently some Kodi users have received notices of copyright infringements. Who has sent them these copyright infringement letters? They have sent Kodi users these notices for streaming content such as sports, TV shows and movies via various unofficial Kodi add-ons. Users who would like to use Kodi but still keep their privacy stuff private should use a VPN service. A VPN service will help you hide your online streaming habits by giving you a different IP location. Our research shows that the best VPN service for use with Kodi is without a doubt IPVanish. What are the reasons for IPVanish being the best VPN service for Kodi users? Well, first of all, IPVanish represents a complete privacy solution for the user who makes use of Kodi to consume content. Readers should also note that if they sign up with IPVanish for a longer period of time, they may be able to take advantage of huge discounts. Discounts that IPVanish offers to all users who commit to the company for more than or equal to a year. As we have already mentioned, installing SuperRepo isn’t that difficult. 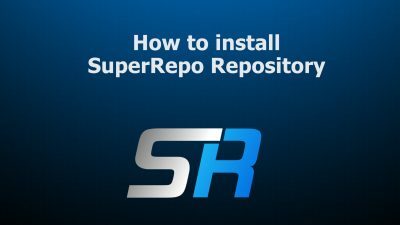 In fact, installing SuperRepo even for new Kodi users is easy enough. In the end, it all boils down to two things when it comes to repositories such as SuperRepo. And then you use the repository. With that said, let’s get to the step-by-step guide. We’re going to assume here that you have installed Kodi on your device. If you haven’t then you can download Kodi for your favorite streaming device from the official website by clicking here. 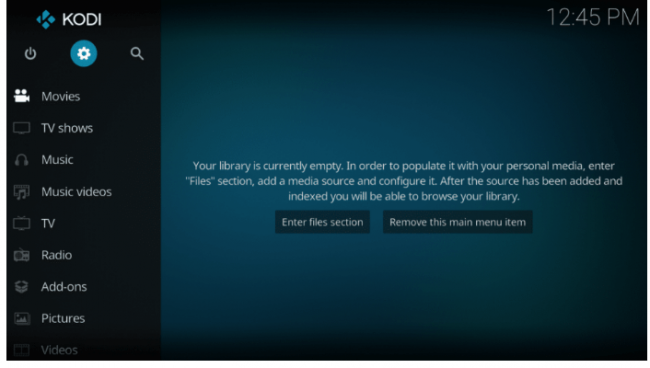 Click here to read our guide on how to install Kodi on your Android and/or PC. With that out of the way, let’s keep rolling. First Run the official Kodi application. Then look at the top left corner of your Kodi screen. There is a gear symbol there. It represents the Settings menu. Then, on the next screen, find the option that says File Manager. On the next screen, you must tap/click on the option that says Add Source. This option usually appears near the bottom. From the resulting screen, you should have no troubles in finding the option <None>. After that, in the text field, you need to type a string. As you can probably tell that it is a web address. So you need to make sure that you type the string exactly as we have shown it to you. Now take a look at the other option that says Add a name for this source. Then give your source a name. Our suggestion is that you use the standard name. When that’s done you must go back to your official Kodi home screen. Once there, go ahead and click on the option that says Add-ons. Now, look at the top left corner of your Kodi screen. There is a symbol in the shape of a package there. Then, from the resulting window, click on the option that says Install from zip. On the very next screen (a smaller window actually) you must find the SuperRepo web source. Now, you should also see a list of some folders. This is where you have to choose the version of Kodi that you have. For example, if you have the Krypton version of Kodi then choose that one. When you are done with that you must click on the folder that says repositories. Now, perform a click on the option that says SuperRepo. If you are finished with the previous step then simply click on the option that says superrepo zip file. This should be present in the same folder as before. Remember that your version numbers may as well change. 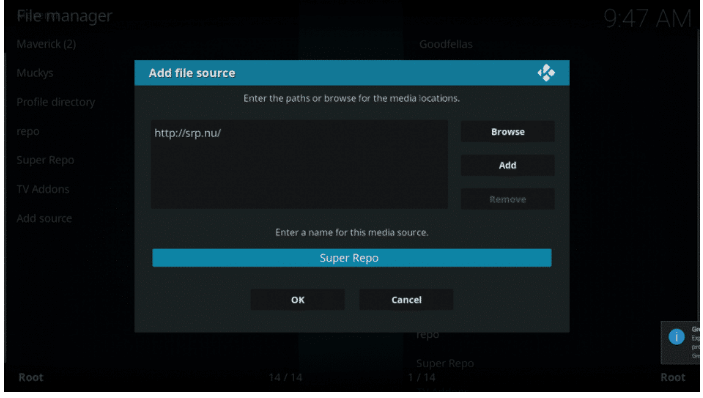 Hence you don’t have to worry if the file version you see is different from your friends or the picture that we will show you after this section in an image guide on how to install SuperRepo on Kodi. When you have finished the previous step, your Kodi installation should show you a successful installation message. It should appear in the top right corner of your Kodi screen. 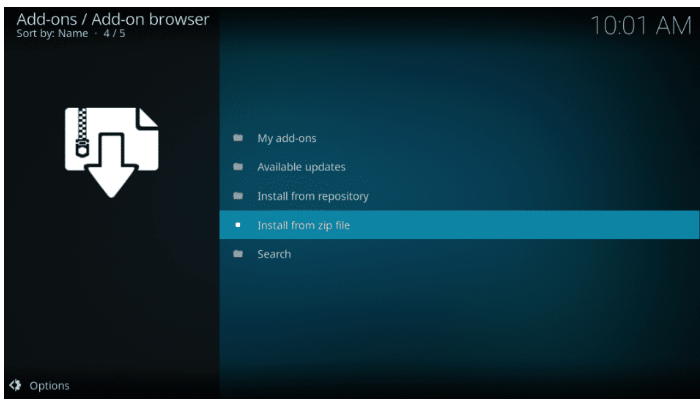 When you have seen the notification about the installation of the Kodi repository then you should make your way back to the same screen where you located Install from zip option. When you get there, click on the option that says Install from repository. Then click on the option that says Video Addons. If you have followed all the steps correctly then now you should see a rather long list of Kodi video addons. All of these addons are actually available for download via SuperRepo. And most importantly, have some fun while you are looking for more Kodi add-ons. We think it is a bit necessary for us to go into a bit more detail about what SuperRepo is all about. SuperRepo is a, what you call, Kodi repository. But it isn’t just a simple Kodi repository. It is a super repository. Or what it suggests in any case. Kodi repositories come in the form of folders. 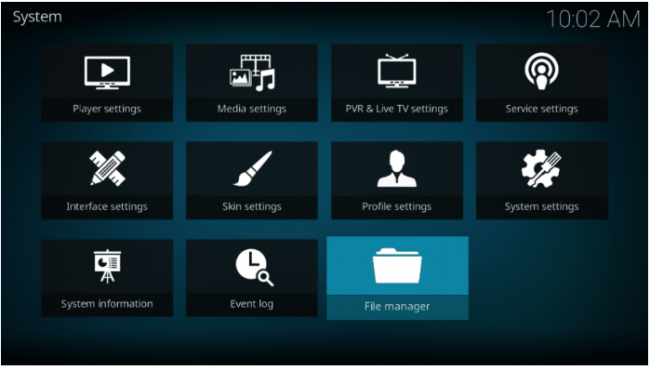 These folders contain various different Kodi add-ons. Or what some might call Kodi plugins. Now, the one thing you should keep in mind is that not all Kodi repositories have the same size. In fact, most of the Kodi repositories that you will find on the internet are rather small. Because the developers behind these small Kodi repositories only put together these repositories on the basis of their experience with a specific Kodi add-on. Usually, when the user comes across a Kodi developer’s repository, the user will typically find a list of addons that the developer of that specific repository has managed to craft in the same repository. The repository also contains information on the dependencies that one is required to satisfy in order to make those Kodi add-on work as they are supposed to. Let’s take an example in order to further clear things up. What we want you to understand is that if you just went online and tried to install some of the most well-known and popular Kodi add-ons for live streaming purposes then you’ll need to deal with some issues. Or rather a few issues. Say you want to install the Rising Tides addon. This add-on will require you to first fulfill another requirement. A dependency file that goes by the name of f4mtester. 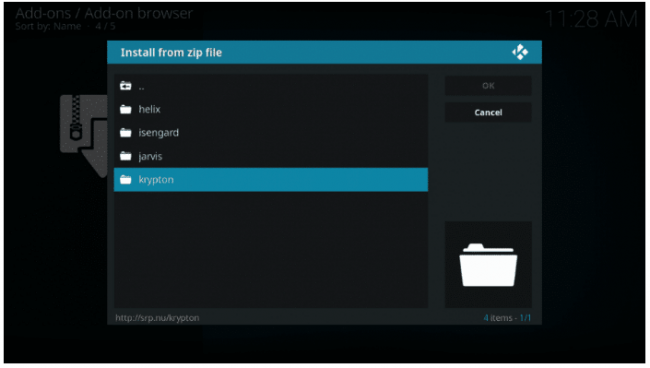 The problem with using a zip file to download and install a given Kodi add-on is that you may never get the chance to satisfy all the dependencies. However, if you take the other route of downloading the Kodi add-on via the developer repository then you will give yourself the best chance of ensuring that you have those dependencies files in place. SuperRepo has another benefit that is aimed at new Kodi users. That benefit is simple enough to understand. Basically, SuperRepo combines all of the larger and smaller developer repositories. It also takes care of all other dependencies and of course, plugins. And it does all of that from a single location. As indicated earlier, this gives new Kodi users two distinct advantages. First, they won’t have to spend so much time scrounging around the entire web while they are looking for developer dependencies and/or repositories. The modern life is about speed. When new Kodi users make use of SuperRepo Kodi repository, they get the opportunity of faster access to many things. Developer repositories. Over 425 of them. Audio content Kodi add-ons. Over 180 of them. Picture add-ons. Over 25 of them. Program add-ons. Over 430 of them. Video addons. Over 1750 of them. In fact, these are the numbers which have made SuperRepo the single biggest repository for all Kodi users. At least for the time being that is true. Of course, that does not mean there are no other big Kodi repositories. But not just as big as SuperRepo. Apart from these big repositories, you should also not ignore the very important and safe Official Kodi Addon Repository. However, the previous truth remains true. 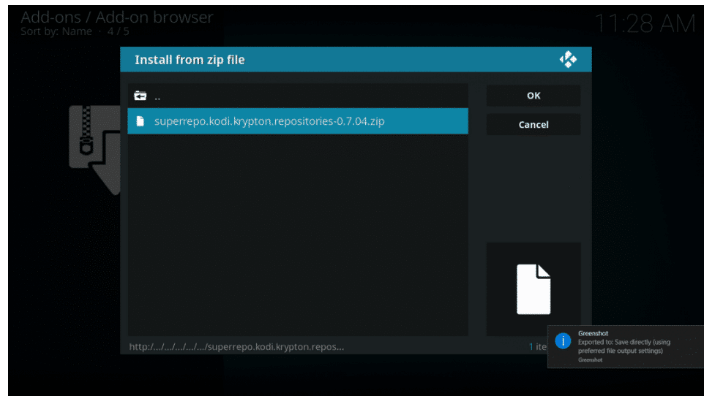 None of these Kodi super repositories have the capability to match the sheer size of SuperREpo. The only other super repository that comes even close to SuperRepo in terms of the number of Kodi add-ons and other stuff is Kodil. Kodil gives you over 1100 video addons. That’s a lot as well. As far as the usage of SuperRepo goes, it is pretty straightforward. In order to open SuperRepo, all that the user has to do is to first go to Addons. And then click on the Package symbol (usually located in the top left corner of the screen). After that, the user has to click on the option Install from repository. From there the user has to choose SuperRepo All. When the user has decided on the type of Kodi plugin that he/she wants to install, then the user should make his/her way to the largest section of the SuperRepo repository. That section, in our case, is the Kodi Video addons folder. This is the place where the user will find more than 1700 Kodi add-ons. All waiting for the user to come and download them. While browsing through the video addons section, we would like the user to notice the quantity as well as the quality of the Kodi add-ons on offer. We are sure that you will find addons that you won’t find anywhere else in the Kodi community. Of course, along with these rare addons, SuperRepo also offers a decent number of other popular Kodi add-ons. There are lots of guides on the internet which show you which are the best Kodi add-ons in each of the popular categories that SuperRepo offers. Now, you already know SuperRepo’s strength points. These strength points are its large number of Kodi add-ons and the way SuperRepo organizes them. But there is one other great advantage that we have not talked about till now. That advantage is that users will get to update their Kodi add-ons much faster and in a streamlined fashion. All of this makes your life easy and worry-free. So let’s say the user has a Kodi add-on that needs some updating. If the developer of that specific Kodi add-on has released the update then SuperRepo will automatically fetch the update of that Kodi add-on and will install it. Of course, you will first have to enable automatic updates via your settings menu. Only after that will SuperRepo get to work. However, for those who want to get more hands-on with their stuff, there is a manual option as well. Users can simply disable the automatic update option and then they can manually update their Kodi add-on. They are also, of course, go to the website of the add-on developer and check for updates manually. To get started on this process, all you have to do is to go to the option of that add-on that you want to configure. You will do it through SuperRepo. And then click on the symbol that represents Update. When you click the Update symbol, SuperRepo will jump into action and will then check for the most recent version available for that specific Kodi add-on. There is also the chance that your Kodi add-on is only available from within the SuperRepo repository. In that case, SuperRepo will first check for any and all available add-on updates. Then it will update the addon automatically as is needed. There may come a time in the future that you like Kodi so much that you install multiple repositories on it. If that does become the case with you then you will probably see several/multiple possible Kodi add-on updates. You may also see multiple install locations for each of your individual Kodi add-ons. This is precisely the case with a very popular Kodi add-on known by the name of Specto. There are several instances on the internet where other Kodi users have shown that Specto Kodi add-on indeed is available in several different Kodi repositories. Specto is coincidentally available in both Kodisrael and SuperRepo. So if you come across a case where your Kodi add-on has multiple install locations then you should also check for the latest or the newest version of the Kodi add-on that you are interested in. For all its greatness, SuperRepo is not perfect. It has some definite flaws. There is no doubt about the fact that Specto is easy to use and has a large number of Kodi add-ons. But that doesn’t mean it has no shortcomings. There is a distinct negative that comes with all Kodi super repositories including SuperRepo. It ails all big Kodi repositories. Kodi users and our readers have to understand one thing. SuperRepo itself does not develop these Kodi add-ons that it lists in its huge database. Hence you will always come across situations where SuperRepo may or may not have the most recent version of a given Kodi add-on available in its repository. So how do you guard against such scenarios? SuperRepo doesn’t know how to develop these add-ons hence it does not know how to update them either. All that the administrators and developers behind SuperRepo can do is to ensure that all Kodi add-on repositories and add-ons alone that they have listed are appropriately updated to the newest editions available from their Kodi add-on developers. As you can probably imagine, this doesn’t (in the real world) always happen. And when it does not happen, it can lead to unfortunate situations. Unfortunate situations where you will find the SuperRepo version of a given add-on either one or two editions behind the latest one. To take an example, currently, you can check online that SuperRepo indeed offers an older edition of the very popular Kodi add-on known as Stream All The Sources. Now, some may say that’s not a huge problem. You can easily use your web browser or any other software application even if it doesn’t have the latest updates. But that’s not how Kodi add-ons work. An older version in the Kodi universe is nowhere equal to an older version of any other software program. Developing working Kodi add-ons is a tough business. And other times they don’t. Largely though, add-ons that get regular updates work. That is the determining factor. If add-ons don’t have access to the latest code, they won’t function. So, practically speaking, an addon that is even one edition behind the latest edition may not work. It will probably be broke in fact. Then there are those times where developers behind Kodi add-ons purposefully hobble their code in the older versions of these Kodi add-ons for a variety of other reasons. So there is always the chance that you may download a particular version of a Kodi add-on via the SuperRepo repository only to find out that it doesn’t work. Or maybe you did install it. And it worked in the beginning. If that is the case with you then follow the step-by-step guide below. Step By Step Guide For When Your SuperRepo Kodi Add-on Does Not Work. First, make your way to the official SuperRepo website. Then look at the right side of the website. You should see a search bar there. That is where you need to input the name of your specific Kodi add-on for which you want the updates. Then navigate some more and make your way to the SuperRepo dedicated page for that specific Kodi addon. After that, you need to copy the last portion of the web address that your web browser is showing you in its URL bar. Then you need to copy the part plugin.video.salts. Now take that copied text and search it on a search engine like Google and/or Bing. This is where you should look for a Github link. When you find the link you must check for the latest updated version of that particular add-on. Remember, always check the version number. Now, if you notice that your SuperRepo add-on version number is older than the version number you have snatched from the developer’s Github page then simply download the add-on zip file directly. Or you could download it from any other site where you can find the update. There are multiple sites out there who host Kodi add-ons that people are searching for in large numbers. Now, even if you follow the procedure described above down to a tee there is no guarantee that you will always find the Kodi add-on that you are looking for on a website such as Github. So what should you do in that case? The first way is to simply try and find out if your Kodi add-on is present in another Kodi repository. In other words, search for a repository that hosts your Kodi add-on. This method is particularly time-consuming. Because you don’t know how much time you will have to spend searching for your add-on. Especially while looking through smaller Kodi repositories. It is true that SuperRepo tries to help users out by listing most of the developer repositories and their websites. But they can only go so far. In other words, they don’t have the repository links to all of their Kodi add-ons. And then you have repositories that are very hard to locate if you actually don’t have a clue about the developer of the add-on. Remember that developers don’t always slap their names on their Kodi add-ons. So your Kodi may not display any information about where it came from or who created it. The other method is to simply leave it and look for another add-on. Of course, we can come into the equation as well. Well, if you have looked for a particular add-on hard enough and you are still interested in it, and it does not some updating then check if we have mentioned the add-on in our various best Kodi addon guides. You can also use the comments section below to leave us a notification about your particular Kodi add-on. Then we can begin our investigation to find out whether the add-on you have request does indeed have a problem in functioning and whether it is available in working order someplace else. Sometimes you may find that the current version (whether good or bad) is actually the one only that is available. List Of Best SuperRepo Repository Kodi Add-ons. So the thing that we have established so far is that SuperRepo may actually not have the latest and most updated version of your favorite Kodi add-ons. But that should not lead you to believe that it isn’t still your best option/source when it comes to the quantity and quality of Kodi add-ons. There are many great popular Kodi add-ons on SuperRepo that work. You also have to give due attention to the several other types of interesting plugins as well. So let’s get started with the list of most interesting Kodi add-ons that you should give a go to via SuperRepo. Specto is probably the best movie streaming video add-on that SuperRepo has to offer. It also has an on-demand TV section. Specto is very similar to another very well known Exodus video addon. This is probably because it has the same structure to it. In a way, all popular Kodi add-ons work in the same way. We’re talking about add-ons such as Genesis Reborn and of course Elysium. Our research says that SuperRepo currently holds the latest version of Specto. Skynet isn’t as popular as some of the other Kodi add-ons that we have mentioned here. It is strange because it offers many IPTV streaming channels. Along with that it also provides users with on-demand movie content. Add to that TV shows as well. As far as interesting choices go, SkyNet is right there with the best of them. Kodi users will find that SkyNet will come up with rare content for them from time to time. The SkyNet Kodi add-on is among the select few Kodi add-ons that actually include a box sets section in their movies category. So what does this box sets section achieve? Well, it basically contains the list of films that are actually part of a movie series. The box sets section gathers all those up and then puts them together to make it easier for users to have access to them. As far as movie content goes, FilmOn is really at the top of the charts. We say that because, first, it comes for free. Secondly, it has fully legal content streams. And you can enjoy all of them via Kodi on your streaming device. SuperRepo doesn’t have many versions of the FilmOn Kodi add-on. For clarity’s sake, it means that SuperRepo contains only the latest and the most recently updated version of FilmOn. 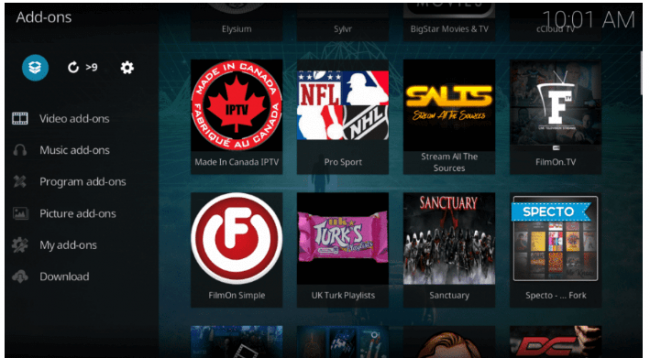 For Kodi users who want to view live channels from outside the United Kingdom and the United States, the FilmOn Kodi add-on represents a wonderful source of content. FilmOn will enable you to take advantage of some unique streaming choices as well. Choices such as, documentaries, comedy, and extreme sports. You might have already understood this by now that even though SuperRepo is a large Kodi repository it doesn’t have the capacity to offer users all Kodi add-ons. In fact, now we have come to know that there are some popular Kodi add-ons and some up-and-coming Kodi add-ons that SuperRepo simply does not offer via its large repository. So, an alternative to SuperRepo is very important especially for those Kodi users who are looking to find some rare Kodi add-ons. If you are one of those users, these are the repositories you should keep an eye out for. As the name suggests, this is the official source of all Kodi add-ons. In other words, you can’t go wrong with downloading and installing this repository. The great thing about add-ons in the official Kodi Add-on repository all the add-ons in this repository come from a first party source. Then why haven’t we first recommended you to read an official Kodi add-on repository guide instead of offering this SuperRepo Kodi repository guide? Many Kodi add-ons in the official Kodi add-on repository don’t work. Of course, that isn’t something that only plagues the official Kodi Add-on repository. SuperRepo also has to suffer this affliction. So why install the official Kodi add-on repository at all? The reason for that is Kodi users can find here many Kodi add-ons from first-party developers which are of high quality. That holds true almost for all first-party Kodi add-ons. They work efficiently and generally maintain high standards when it comes to quality of the content they offer. Especially when you compare them to the vast majority of Kodi add-ons from third-party developers. The official Kodi add-on repository is truly unique. It is unique in the sense that it is the only repository that offers add-ons such as Crunchyroll and FUNimation. You may not like the content that these two add-ons offer but you should know and both of these add-ons work reasonably well and integrate even better with the Kodi application. Most, if not all, Kodi applications come pre-installed with the official Kodi Add-on repository. So just go ahead and find it with other Kodi repositories within your Kodi application. The Smash Repository has undergone huge changes in the last few months. Its developer actively maintains the repository. Any Kodi user who is looking for the latest version of Exodus will find no respite in SuperRepo. But Kodi users can download the latest version of Exodus via the Smash Repository. Unlike SuperRepo, the Smash repository does not have a great number of Kodi add-ons. It has fine-tuned its focus on actively maintaining a few of the most popular Kodi add-ons. Especially those popular Kodi add-ons whose developers have abandoned them. For those looking for a genuine alternative source for SuperRepo should stop looking. And install the Kodil Repo. Kodil Repo does suffer from the same issues that all other Kodi repositories suffer with. But even then you will eventually come to know that Kodil updates its add-ons more regularly than SuperRepo does. Now, as we mentioned before in this guide, SuperRepo may not have the latest version of SALTS addon. But the latest version of SALTS add-on is available in both Smash and Kodil Repositories. That takes a decent amount of work. The original developers behind SALTS abandoned the add-on sometime ago. And that made it hard for people to find the updated version of SALTS. But since Kodil does have the latest version of SALTS, users who enjoyed SALTS can do so by installing the Kodil repository. Now that you are somewhat well versed on how to install SuperRepo on Kodi, there are some things that you need to know. You see, when you download and install these Kodi add-ons you are basically giving these add-ons the permission to access your machine. For users who have sensitive and private data on their machine, super repositories like SuperRepo can cause problems. These problems mostly come in the form security risks. Now, with that said, it is true that hacking events on their own are relatively rare in the Kodi add-on community. But they do have a tendency to occur from time to time. So as cautious Kodi users do, you should understand the tangible risks that come with using Kodi and installing third-party Kodi add-ons. Needless to say that this also stands true for Kodi repositories. That’s why we always recommend that you should use a VPN service with Kodi. VPN services like IPVanish are perfect for Kodi because of their speed and reliability. The other reason why you should use IPVanish instead of other VPN services with Kodi is that IPVanish supports all Kodi add-ons. Superrepo is putting out false updates. Noobsandnerds now Goliaths. Kodi repositories go out of business and then rise up time and time again. Goliaths developers left the add-on back in May 2017. It is true that Noobs and Nerds developers have also left, but there is still hope that this add-on will continue to receive updates. We can say for sure that “false updates” is a problem that ails all unofficial Kodi add-ons. Just disable automatic updates and you’ll be safe from those false updates. I Tried To Install The SuperRepo All Add-on But Every Time I Try, It Keeps Taking Me Back To The Previous Page. Tried To Install The SuperRepo All Add-on But It Keeps Taking Me Back To The Other Page. Is It Because It’s Down Or Something Else? Are you sure you are using the link srp.nu/ when trying to install SuperRepo via Kodi (The part where you have to click on None and input a URL)? Thanks for the comment Dany. Are you having connection issues? Maybe you should check the URL for the add-on again. When trying to install from zip file, navigation through the SuperRepo folder is hard. Selecting the SuperRepo folder work only after the 3rd click and then selecting the next folder (Krypton in my case) will take me back to Root instead of next folder. I managed to somehow reach the zip file and selected it, but after that, the install failed. Thanks for the comment Carlos. SuperRepo is not country restricted. But you never know what your internet service provider is up to. Our recommendation would be to first try a free VPN and then try to install. After that, if you want smooth streaming along with protection then go with something like IPVanish. Mr fedup, thank you for the comment. We’re currently researching all available news methods.